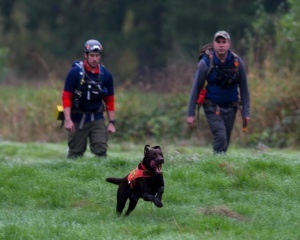 Airscent dogs are trained to find any live human in a mountain, forest, park or urban setting. The dogs typically work off-leash along with their handler and one or more support personnel and do not need a sample of the search subject’s clothing or other scent article to find them. 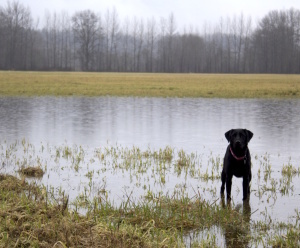 Airscent dogs must be able to work off trail in difficult terrain and inclement weather for up to several hours at a time ignoring distractions such as wildlife and strange noises. How do you train an airscent dog? All KCSD training is done through positive reinforcement of desired behaviors exploit the strong intrinsic prey/food drive and harness the spectacular sense of smell dogs possess. The goal of this operant conditioning is for the dogs to always think that searching is a really fun game. This approach helps to produce confident, enthusiastic search dogs. While searching requires energetic dogs (and handlers) they must also be highly socialized to perform well around other dogs, unfamiliar people and loud machines. KCSD airscent dogs are taught to return immediately to their handler after finding a search subject and to indicate their find with a ‘trained indication’. The dog then leads the handler and search team back to the subject. The dogs think this is just all great fun and it allows the dog to range a distance from the handler while searching and permits the team to cover a vastly larger area than if the dog was working alongside their handler. Training begins with a ‘back chaining’ technique. The dog is taught to communicate with their handler of a positive find using their ‘trained indication’. This indication is specific to each dog and is a behavior that they eagerly perform only while searching. For some, this is a tug on a toy attached to the handler, other dogs enjoy jumping on their handler as an indication. From there, the association begins to form for the canine between finding a person, communicating with the handler via indication, bringing them back to the subject via a ‘refind’ and a reward. When the dog correctly performs the behavior, they immediately get a party full of playing with the toys, or treats from the practice subject. From there, other aspects of a search are added one at a time, increasing in complexity (such as increasing time, size of area, number and condition of subjects, vertical subjects etc). Variables are only added one at a time in the practice searches and mastered before adding more. K9 Oso doing a runaway: KCSD dogs love airscent! A dog’s sense of smell is estimated to be over a thousand times better than a human’s. Depending on the breed, dogs have 250,000,000 olfactory receptor cells attached to highly convoluted epithelium in their nasal cavity. It is estimated that the total surface area of the primary dog olfactory region is about one square foot! As much as 30% of a dog’s brain is devoted to detecting and analyzing smells; proportionally 40 times more than people. Dogs can even detect differences in scent concentration between their two nostrils allowing them to determine the direction from which a smell is coming!